A Juicy Early Ripening Blackberry. Blackberry Arapaho Thornless is the earliest Thornless Blackberry in existence. An important characteristic is its small seed size. The berries are large, very firm, and tasty with excellent flavor, and the berries are a favorite of songbirds and butterflies. The Arapaho Blackberry Plant is a self-supporting blackberry plant (does not need a trellis) that ripens earlier than any other thornless variety, in the last of May. The large berry of the Arapaho Blackberry Plant is a colorful berry with reds and blacks. Arapaho Blackberry produces sucker plants which allow it to quickly establish a solid hedge row of plants. This new blackberry variety can be distinguished by its thornless canes with erect growth habit, its early ripening, and its excellent fruit flavor and firmness. 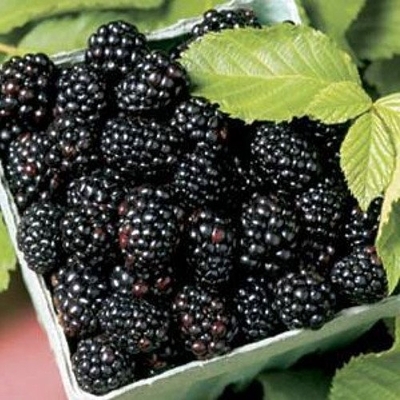 Blackberries thrive in sandy or good to average garden soil. Plant them in full sun. In home gardens, keep plants about 3 feet apart. If planting in rows, keep them 3 feet apart in the rows, and keep the rows 5 to 8 feet apart. Mulch around the plants to a depth of 4 to 6 inches. Maintain depth of mulch by adding as necessary throughout the year. This berry is very low in Saturated Fat, Cholesterol and Sodium. It is also a good source of Vitamin E, Folate, Magnesium, Potassium and Copper, and a very good source of Dietary Fiber, Vitamin C, Vitamin K and Manganese.